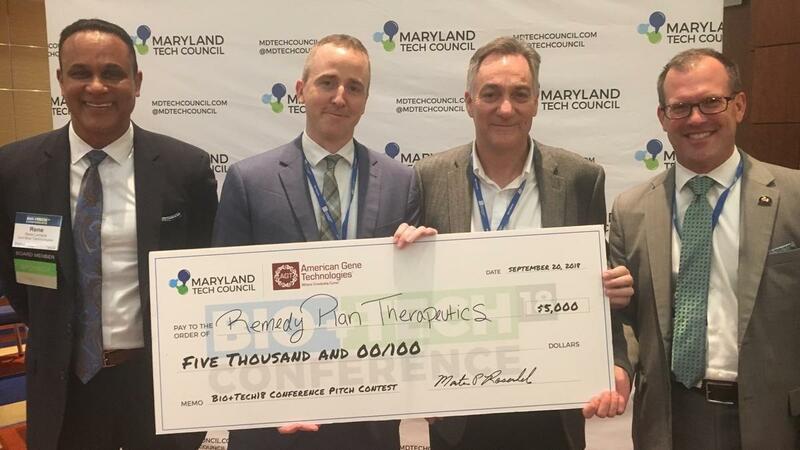 Rockville-based biotechnology company Remedy Plan Therapeutics took home $5,000 Thursday as the winner of the Maryland Tech Council's inaugural Bio+Tech18 pitch competition. That money will go toward a larger, $13 million round the company is looking to raise to fuel development of its first drug product. Five-year-old Remedy Plan has been in stealth mode for the past several years, as it worked to develop its initial pipeline of drug candidates. The company is making drugs that target cancer stem cells, which are the cells that enable tumors to grow and spread. CEO Gregory Crimmins said Thursday's pitch competition marked the first public presentation he has given on Remedy Plan's work. "It's exciting to see people respond well to what we're trying to do," he said. "We are looking to raise a $13 million funding round, and this was kind of our kick-off for that effort...A couple investors even expressed some interest after the competition." Crimmins said his company has previously raised about $3.4 million in funding. It is now looking to raise a much larger round, which will be used to push Remedy Plan's first drug product through Phase 1 clinical trials, which is one of the first steps in the process of gaining federal regulatory approval. It will take several more years, though, before the product is market-ready. Five finalist companies, including Remedy Plan, were selected from a pool of about 20 applicants to compete in the pitch competition, held during the tech council's annual Bio+Tech conference in Baltimore. Other competing startups included AlgometRx, JuneBrain, Sonavex and VakSea. This was the first year the conference hosted the pitch competition. The tech council said the inaugural event was a great success, and hopes to grow the pitch competition in size and scope each year. Remedy Plan has seen other support from the tech council as well. It has participated in the council's Venture Mentoring Services program, which aims to assist startups preparing to raise their first big venture capital or institutional rounds of financing. Crimmins credited that program for helping his company get to where it is today.